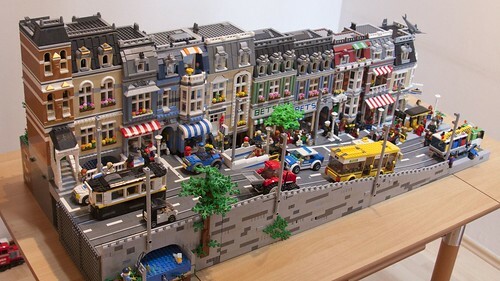 Brick Town Talk: Gradient Grandeur - LEGO Town, Architecture, Building Tips, Inspiration Ideas, and more! Row House Hill - (BTT) It seems that sloping streets are all the rage, and for a very good reason. Ten unique buildings make up the street, housing everything from from travel agents to psychiatrists. If you aren't in the mood to navigate the changes in elevations on foot, fear not - there are both trolley cars and subway trains at your disposal. How do the road tiles stay flat going up the hill? I'd love to recreate something similar to this with the Bat Cave underneath it!